Is there a better alternative to CPPlay? Is CPPlay really the best app in Developer category? Will CPPlay work good on macOS 10.13.4? CPPlay lets you play with C/C++ code without distractions. Traditionally, when writing C/C++ code, you go through the edit-compile-link-execute stages. When you are learning or when you are being creative this is a major waste of time. What you want ideally is to be able to write code and try it, then tweak it a bit and try it again. Quickly. You want to be productive and focused and your development environment must not get in the way. CPPlay needs a review. Be the first to review this app and get the discussion started! CPPlay needs a rating. Be the first to rate this app and get the discussion started! 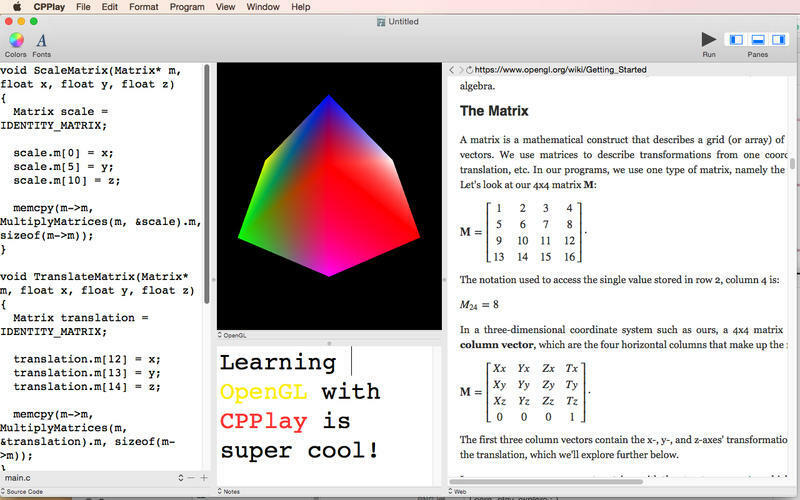 CPPlay features a C/C++ interpreter integrated with OpenGL and OpenAL and it enables exactly that kind of workflow. It is built on top of LLVM and clang, which are the basis of some of the most robust and optimised C/C++ development environments today.